For Caravan Storage Yatala - Oasis offer the perfect solution for your treasured vehicle. Storing a large caravan, motorhome or boat can be a painstaking process. If you store it at home, you end up losing a huge amount of space. Plus it can be an eyesore! 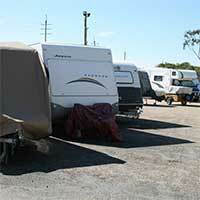 Many people struggle to find a safe and secure caravan storage in the Yatala area. However, now with the grand opening of our new facility, your problem's solved! We understand how valuable your caravan is to you, so allow us to look after your vehicle in our safe and secure facility. We have the best security with new CCTV 24 hours a day, 7 days a week. Your vehicle remains protected at all times. If you need a first-rate caravan storage in the Yatala region, call in to find out more about all of our services and features. Best of all, lengthy contracts are not required, 1-month minimum. We make it easy to rent out the right space for your vehicle. Oasis Storage Ticks All The Boxes! Unless you’re always road-tripping around Australia, chances are your caravan is cluttering up your lawn or driveway, or even worse sitting on the street! What an eyesore that might be, especially for your neighbours! Talk to us for the best prices and no locked-in-contracts; you choose for how long you want to store your vehicle. Is it time to de- clutter your home? Self Storage for all your unused household items too. Reclaim your spare room or over packed wardrobe space. Place all the stuff you don't use every day into storage. Call Oasis Storage in Yatala today, or pop in for a chat and more info. We focus on providing a first class service to suit all budgets. Don't forget all the personal items too; we make self storage easy!